Jim Sandusky will be our song leader for this evenings singing. Jim is the minister for the West Main Church of Christ in Manchester, GA.
7:00 – “Deeper Than Five Acts of Worship” (David Hester). “Faithful Men of God” (Roger Johnson). “Faithful Women of God” (Doritta Johnson). Louis Francis will be our song leader for this evenings singing. Louis is a member of the Edgewood Church of Christ in Columbus, GA.
7:00 – “Deeper Than Attendance” (Roger Johnson). 9:30 – “Deeper Than Bible Study” (Frank Lyons). 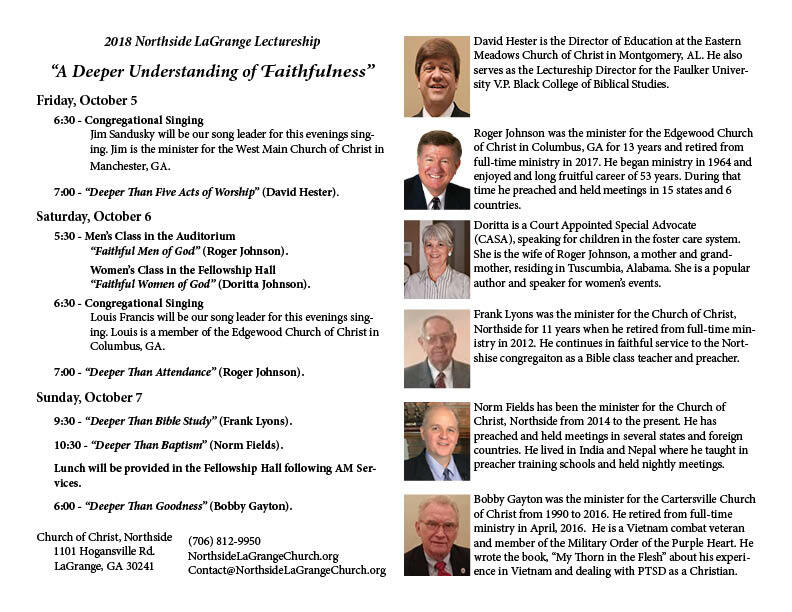 10:30 – “Deeper Than Baptism” (Norm Fields). Lunch will be provided in the Fellowship Hall following AM Services. 6:00 – “Deeper Than Goodness” (Bobby Gayton).